NIGERIA police have summoned the head of the country’s upper house of parliament for questioning after members of a criminal gang implicated him following a brutal bank robbery that left 33 people dead. Senate President Bukola Saraki, the third-most powerful politician in the country who has denied the allegation, served from 2003 to 2011 as state governor of Kwara, where the brazen daylight robberies took place in the central town of Offa on April 5. National police spokesperson Jimoh Moshood said 22 suspects have been arrested over the robbery of six Offa banks, including five ring leaders who alleged Saraki’s involvement in the gang. 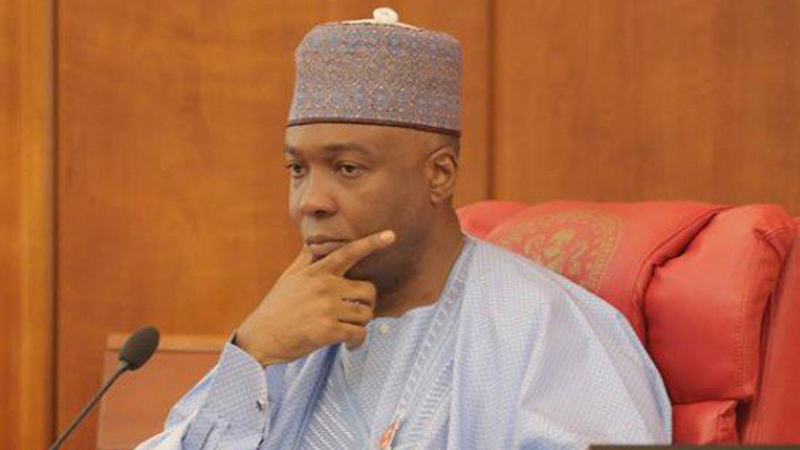 ‘Senate President, Senator Bukola Saraki is being invited by the Nigeria Police Force… to answer to the allegations levelled against him from the confessions of the five gang leaders,’ AFP quoted Moshood as saying in a statement. Moshood said a Lexus jeep purportedly owned by Saraki and used during the robberies had been traced to the government office in Ilorin, Kwara’s state capital, and two of the governor’s personal aides had also been arrested. ‘Investigation is ongoing and effort is being intensified to arrest other suspects still at large. All suspects involved will be arraigned in court for prosecution on completion of investigation,’ he added. The embattled Saraki, who is currently facing graft charges, last month hinted at a plot by the police to implicate him in the robberies. In a statement on June 3, the Senate president promised to honour the police summons, but insisted he had no link with the robbers. ‘Let it be known that there is no way I could have been associated with armed robbery against my people,’ he said. ‘When the Offa robbery incident happened, I was the first top public official to pay a visit to the place and right there in the palace of the traditional ruler, I put a call through to this same Mr. Ibrahim Idris, the IGP (Inspector General of police), requesting him to make certain specific security arrangements as demanded by the people,’ he added. Saraki said he was being framed because of his differences with the police boss over his shoddy handling of killings of innocent people across the country. ‘This plot is concocted to embarrass me and, in the mind of the IGP, it is his own response after his refusal to honour the invitation by the National Assembly, headed me, for him to come and offer explanations on the rampant killings and violence across the country,’ Saraki said. Saraki is a member of the ruling All Progressive Congress (APC), the party of President Muhammadu Buhari and Vice President Yemi Osinbajo.